Apoptosis has a vital function in the uterus in maintaining the homeostasis of cell number during the estrous cycle and in the tissue remodeling inherent in blastocyst implantation and development of the placenta. During the estrous cycle, estrogen and progesterone secretion control not only the proliferation and differentiation of luminal and glandular epithelial cells, but also their death by apoptosis (1). Decreases in the levels of estrogen during the estrous cycle or during later stages following a single estrogen treatment of ovariectomized animals initiate a wave of cell death in the luminal epithelium that is predominantly apoptosis (2–4). 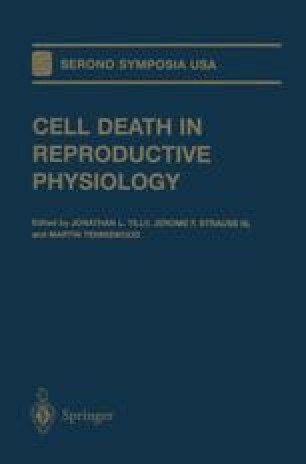 Several lines of evidence suggest that during blastocyst implantation the death of uterine epithelial cells adjacent to blastocysts is the result of apoptosis (5, 6).